After gearing up and going over the tour plan and safety instruction you head down to the black sand and the coast line. On the way you cross a few small rivers. When you are down at the black sand you head across the coast line towards the old plane wreck. From there you drive across the black sand and return to the base. 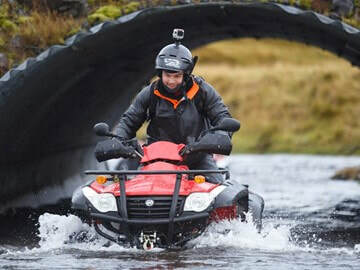 This tour will give you the opportunity to enjoy the magnificent and unique landscape formed by the volcano Katla which now lies dormant under the icecap Mýrdalsjökull. 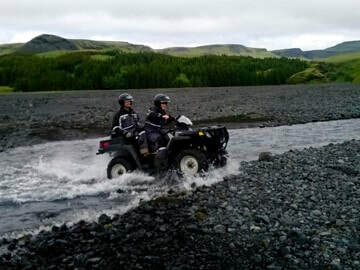 Weather and visibility allowing, the great view to the glacier and along the coast line to Dyrhólaey can be enjoyed. ​MEETING POINT: The meeting point is 9 km east of Skógar and 23 km west of Vík. Take road #222 and drive about 1,2 km.